Our final day of Blog Hop Challenges for this release at There She Goes, and we have two FABULOUS sets from Melyssa!! Let's get started!! Snow buddies is a 6x8 set that includes a total of 57 stamps and will sell for $24.00. 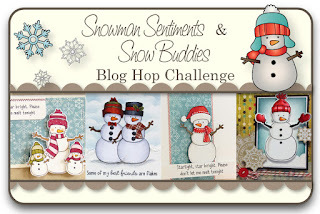 Snowman Sentiment is a 3x4 set that includes a total of 9 stamps and will sell for $9.00. 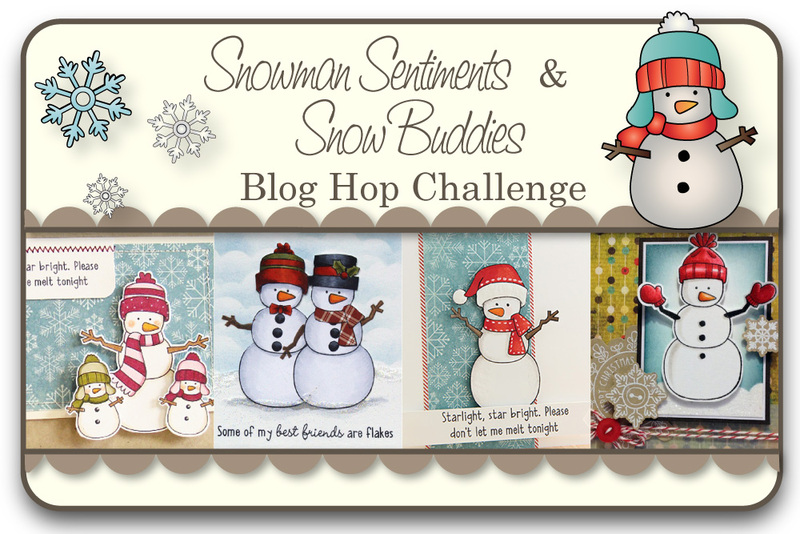 Would you like to win the new Snowbuddies or Snowman Sentiments stamp sets? Here is what you need to do- visit the Trendsetter’s blogs that are participating in each of the blog hop challenges below and comment on their creations as you go. One of the Trendsetter’s blogs (from each hop day) will be randomly chosen as the ‘it’ blog and a winner will be picked using a random number generator from the comments left on that Trendsetter’s Blog Hop Challenge post. The texture behind your snowman really gives it something extra. Love the rounded corners. Love the sentiment Angela! Super cute! This is so cute! I love your papers. Oh wow those neon colours really make the snow buddy POP! Sweet little image and an awesome card! Beeeeautiful - yep, love this Angela! Very cute! I love the snowflake DP. What fun dp!! I love how the image is colored as well! Super cute! I love your coloring. The textured background looks great--very snowy. I love the strip of green swirly paper behind the snowman. A beautiful card! I'm lovin these almost neon colors. So non traditional xmas but it really works. 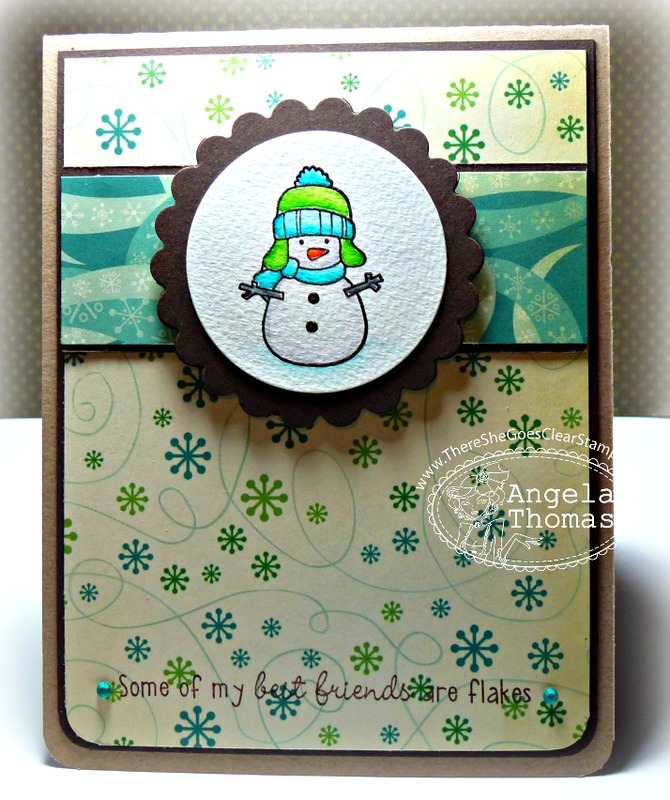 Its such a simple and beautiful card..
What a fun snowman card. Love the colors! I love the paper you chose to use with your image..it's perfect! This is so cute Angela, the snowman is adorable and I love the sentiment. Cute snowman! Love the snowy texture! I must say I love this little guy! Fantastic card to! So cute! Great papers and color choices! Lovely card! love the texture behind the snowman and snowflakes background. super cute card, love the snowman. And your coloring is so pretty. I can't wait to see all the whole set. Such a cute card. Love the layout. Love your color combinations - cute card! Beautiful card...the snowman is adorable and really like the snowflake patterned paper. Sweet card! Such a deal for this set! Would love to win it! So cute with this color combo! This little snowman is very cute. Love the snowflake background. Great choice of colors! Very sweet card! love the snowman!! Great papers and it really feels wintery!